Dendritic spines are a preferential site of synaptic axodendritic contact; they are sparse or absent in some types of nerve cells (motor neurons, the large cells of the globus pallidus, and stellate cells of the cerebral cortex), and exceedingly numerous in others such as the pyramidal cells of the cerebral cortex and the Purkinje cells of the cerebellar cortex. Dendritic spines were first described at the end of the 19th century by Santiago Ramón y Cajal on cerebellar neurons. Ramón y Cajal then proposed that dendritic spines could serve as contacting sites between neurons. This was demonstrated more than 50 years later thanks to the emergence of electron microscopy. Until the development of confocal microscopy on living tissues, it was commonly admitted that spines were formed during embryonic development and then would remain stable after birth. Spines are the primary site of excitatory synapses. Smooth endoplasmic reticulum can form complex structures localized to large spines. The cytoskeleton of spines is mostly composed of actin. Trans‐synaptic adhesion molecules as well as proteins secreted from astroglia help stabilise synapses. Spines can act as small biochemical compartments. Spine structure is responsive to activity. Dendritic spines are known to change shape, to the extend of appearing and disappearing entirely. It has long been hypothesised that such changes may be the basis of memory itself. The elucidation of how these elements of memory are brought about remains one of the most exciting and important in the whole of biology! Despite their modest size, some dendritic spines contain a specialized type of smooth endoplasmic reticulum organised as stack and referred to my some as “spine apparatus”. 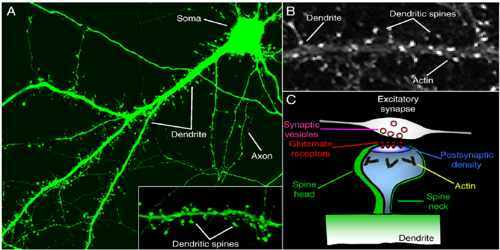 Structurally, excitatory synapses located on dendritic spines are asymmetric, with a presynaptic bouton that contains round clear vesicles apposed to a postsynaptic density where glutamate receptors are anchored. Spines form biochemical compartments that can isolate activated signalling pathways that occur at one synapse from those at other synapses, thereby providing a way to enhance the specificity of connections between neurons in the brain. 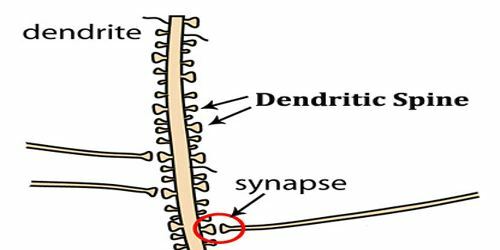 Structural changes of dendritic spines in response to stimulation facilitate changes in synaptic strength, and these changes are likely to underlie important higher brain functions such as learning and memory. Dysregulation of spine morphology is seen in several neurological disorders such as Alzheimer’s disease and fragile X syndrome. 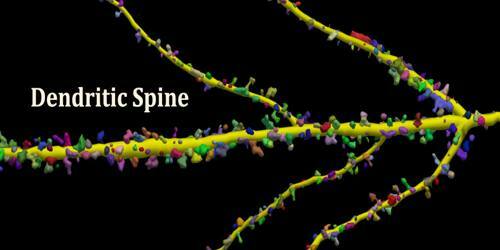 Dendritic spines occur at a density of up to 5 spines/1 µm stretch of dendrite. Hippocampal and cortical pyramidal neurons may receive tens of thousands of mostly excitatory inputs from other neurons onto their equally numerous spines, whereas the number of spines on Purkinje neuron dendrites is an order of magnitude larger. The compartmentalization of dendritic spines can be broadly divided into two functional domains: (i) the biochemical compartment, which describes the spatial confinement of biochemical signalling due to diffusional restriction and physical segregation of proteins and signalling molecules; (ii) the electrical compartment, where spine neck morphology can impact the kinetics and propagation of synaptic potentials in a spine-specific manner.